Checkers has never been the same since Connect Four. 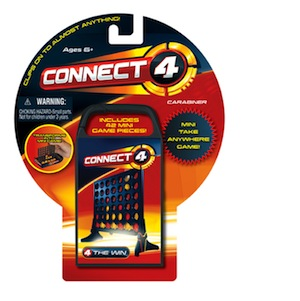 Now there's even more of a challenge with Electronic Hand-Held Connect Four. Here, you're going up against a machine. Play the traditional game of trying to get four in a row--horizontal, vertical, or diagonal--while blocking the computer opponent. Add more of a challenge by choosing Game 2: the checkers disappear, and it takes memory and strategy to win. The arrow keys keep you in complete control of the game, and you can even shut off the sound to better concentrate. There are three different skill levels to keep things interesting, or if it's too hard, the computer will offer hints with the press of a button.